Having never been a Trekkie, no one was more surprised than me when I loved the 2009 franchise reboot from JJ Abrams. I kind of love it a lot. I own it and watch it sometimes and enjoy it immensely every time. 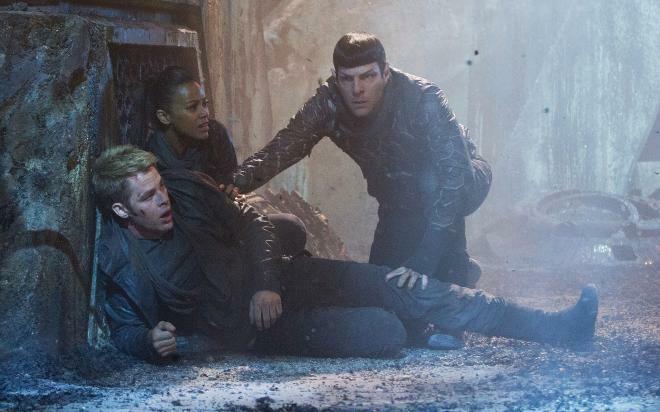 Abrams made Star Trek accessible, trading in the Deep Thoughts with Kirk and Spock for fast-paced action grounded by very humane character moments. I know a lot the Trek fandom was annoyed at Abrams’ tone and just, everything really, but Star Trek had for so long been the tiniest kid given the biggest wedgie and stuffed in the grossest locker, and Abrams made it cool again. He made it okay to like Star Trek. And then he promptly forgot everything that made his 2009 reboot great and produced a draggy, kind of boring and heartless piece of space popcorn that abandoned its early, interesting premise of Captain Kirk (Chris Pine) getting demoted and having to learn some humility in favor of a to-militarize-or-not-to-militarize-space debate that never actually gets fleshed out. There were fits and starts of several equally plausible and vastly more engaging films in Star Trek Into Darkness but none of them ever actually arrive and deliver a movie that would stick in your mind the way the 2009 one did. That movie benefitted from Kirk and Spock (Zachary Quinto) coming of age and meeting, disagreeing, and then finding common ground. Their friendship was the anchor and their development the point and the film worked as a coming of age story. Darkness never really works as anything because it doesn’t have any purpose. Don’t get me wrong—Darkness is fun in stretches. It never quite hangs together, but individual scenes are exciting, and there are a couple righteous brawls to tide over the action-hungry audience members. But in between those points it’s slow and uneven, with a huge amount of narrative going unscoped in favor of leaping into more action (could have done without the space drop sequence as it was very similar to the base jumping scene in the first film). Still, there are enough up beats to keep the film going. 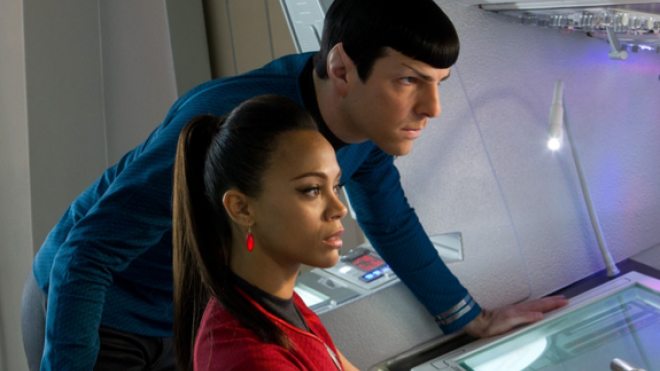 The effect of the ships going into warp drive was lovely every time it was used and Kirk finding out Spock and Uhura (Zoe Saldana) were fighting and exclaiming, “What is that even like?” drew a big laugh. 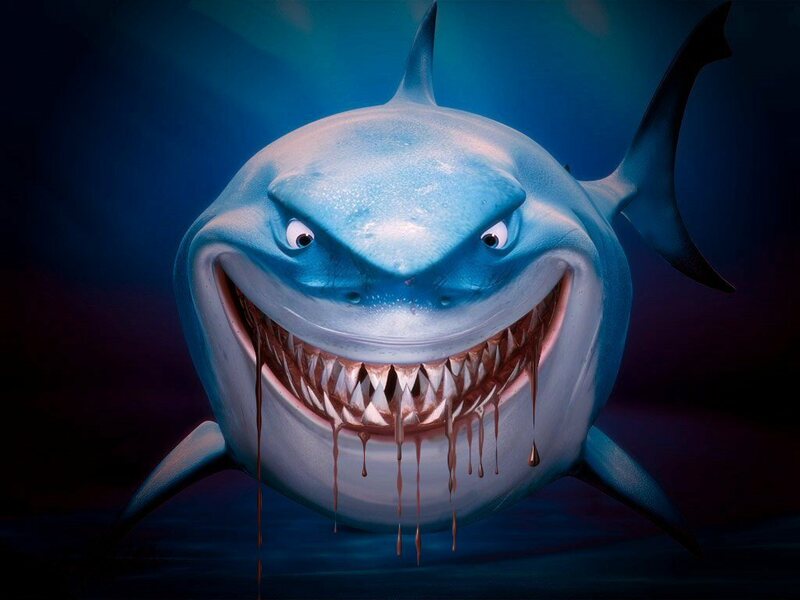 It’s not a bad movie, it’s just not any kind of continuation of or improvement on the first film. What didn’t work about Darkness is its narrative function, which seems more the fault of screenwriter Damon Lindelof, who has this problem consistently. It’s never telling us a cohesive story but instead starts three different narratives and proceeds to abandon all three. The first narrative begins when Kirk violates the “Prime Directive”, which states that no primitive civilization can be exposed to advanced technology, in order to save Spock, and Spock thanks him by getting Kirk demoted. 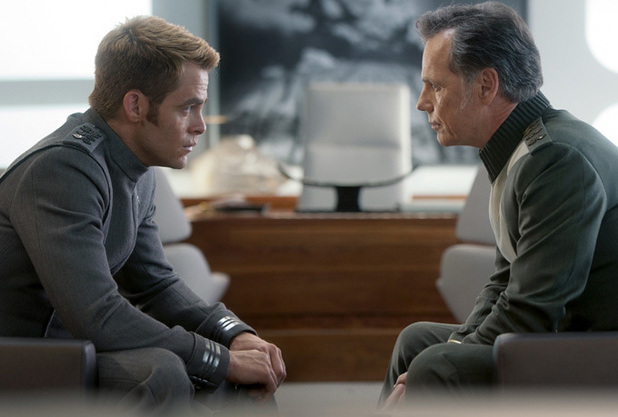 The demotion scene is one of the strongest in the film and Pine and Quinto, plus Bruce Greenwood playing Kirk’s de facto daddy figure, Christopher Pike, carry it beautifully. I would have been very interested to see a movie about Kirk and Spock falling out and going their separate ways and the journey that brings them back together a friends and fellow officers. But that plot ends about five minutes after it begins and Kirk has no problem getting reinstated as a captain. It was supremely annoying how no consequences were applied to Kirk in the long run for breaking what was built up as Star Fleet’s Mega Rule You Do Not Break. But by far the most interesting and most underserved narrative was that of the villain, John Harrison, aka Khan. 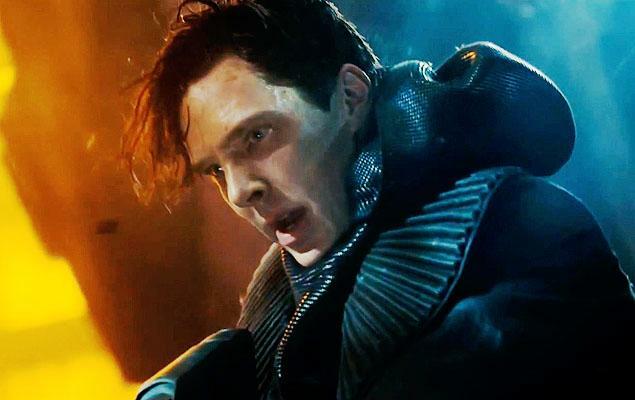 Played by Benedict Cumberbatch in his mainstream debut, Khan was barely fleshed out and relied too heavily on the audience being familiar with previous Star Trek properties. What was great about the 2009 Star Trek was that you didn’t have to know anything about Star Trek to roll with it, but Darkness supposed that everyone would get why Khan was a big badass without really justifying it in the present. Cumberbatch proved more than up to the task of being the big bad in a major blockbuster, bringing a silky kind of menace to Khan and a surprisingly capable and bulked-up physicality to the role. But where Marvel works to toe the line between Loki’s hurt and his rage, Lindelof and Abrams make no effort to give Khan a similar arc. 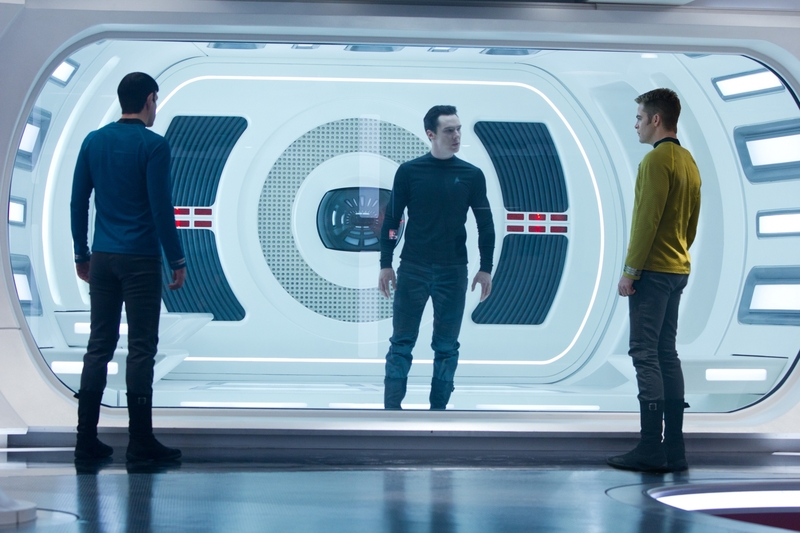 I can’t help but think Star Trek Into Darkness would have been better off if it earned that title and the movie was about John Harrison falling in with Kirk and Spock and the slow reveal of his true identity as Khan was saved for the very end, when he committed some atrocity and took off into open space, leaving the door open for future conflict. It would have given Cumberbatch more to do, given the film a much-needed emotional core, and earned every bit of that “into darkness” line. Do we even need to mention the Alice-Eve-in-underwear-for-no-reason-what-so-ever? I thought it was a fun popcorn movie whose main crime was laziness. I liked it but I could have loved it if they did things better. I am totally a star trek fan and as a kid loved many of the series and movies. What I loved about the Reboot was a chance to see Kirk and Spock develop in this new timeline. What kind of men would they become? But this film basically ripped off the most beloved film in the franchise(at certain scenes the dialogue was totally paraphrased). That is just lazy. It didn’t bother me about the eternal debate about startfleet as being exploratory vs. military because that is the question that drives every single series/movie. Who are we as living creatures/humanity? What do we want to be? How do we interact with different societies? The real crime of this film is that they don’t give BC enough to do. In the original WOK you get plenty of Khan’s back story and motivation. It is what makes him such a compelling villain. JJ dispenses with all of that. It really hurts the film because BC was fantastic!!! The Khan story line was a late insert into the script and it shows. Sloppy sloppy sloppy. Strange that for all its faults, I really really enjoyed it. Honestly I would watch this group of actors in anything. They struck absolute gold with this cast. That’s really the draw so I will be far from heartbroken if Abrams and his crew are minimized for part 3 (which we are likely to see in 2016 for the 50th anniversary). I do love the Rian Johnson suggestion. My guess is it will just be the trilogy with this cast. Quinto doesn’t seem to keen in going beyond that and Pine will make way more money off the Jack Ryan movies anyway. I’ve seen several lukewarm reviews now. Too bad, since the 2009 film was so fun to watch. I’ll still go see it, though. 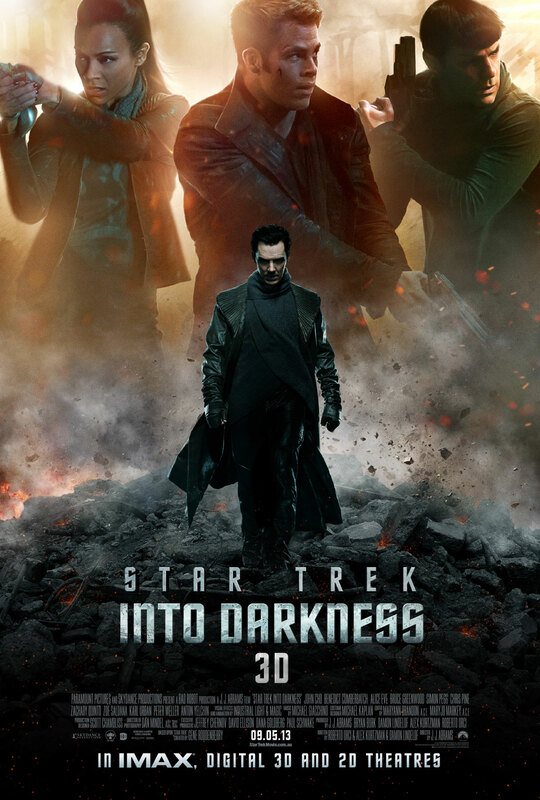 I’m not a huge fan of Star Trek, so I’m going to see this movie for the ‘batch. I have a big thing for Sherlock. The plot is pretty much irrelevant if I can hear Benedict’s rich baritone in stereo.